Inventory We are a resale marketplace, not a box office or venue. Ticket prices may exceed face value. This site is not owned by Florida Theatre Jacksonville . 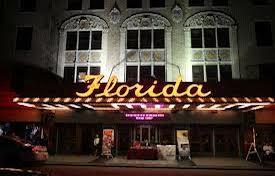 The Florida Theatre in Jacksonville opened originally in 1927 and is on the US National Register of Historic Places. The Florida Theatre box office is located at 128 East Forsyth Street in downtown Jacksonville, FL. The theatre closed from 1980 through 1983. Today the venue brings a variety of traveling Broadway, family shows, concerts and comedians to provide customers with the most intimate of live event experiences. TheaterJacksonville.com is a privately held company that specializes in the sale of tickets in the secondary market. We are not affiliated with any official supplier or box office. To purchase tickets to any Florida Theatre for the Performing Arts Moran Theatre in Jacksonville events simply call our operators at anytime or click on the event you wish to attend.